Definitions of words can be boring stuff, but sometimes they are important. Sometimes people get quite excited, perhaps even angry, over them. The words atheist and agnostic have been examples of this in recent years. Way back in my barely remembered youth, I completed an Engineering degree at University, during which I passed two courses in philosophy. Back then, the definitions were simple – an atheist didn’t believe in God, a theist did, and an agnostic didn’t have any belief either way. But it is common these days to find atheists who define the term to mean “without theism”, in the same way that “amoral” means without morals. They are not necessarily saying God doesn’t exist, only that they have no belief that he does. Many of them then go on to argue that this means that the “burden of proof” is on the theist, and they as atheists are exempt from offering reasons for their disbelief, because they are not asserting God doesn’t exist, only reporting that they have no belief that he does. Some of their opponents argue that they are using this tactic to avoid having to offer evidence for their disbelief that, it is argued, they don’t have. This approach was first proposed by atheist philosopher Antony Flew in a paper which became chapter 1 of his God, Freedom and Immortality and is available online here. Flew recognised that he was changing the established meanings of the words (“The word ‘atheism’, however, has in this contention to be construed unusually…. 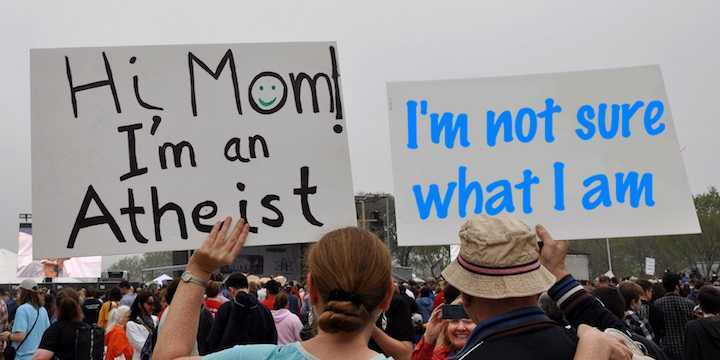 the usual meaning of ‘atheist’ in English is ‘someone who asserts that there is no such being as God'”). But he argued that it helped his main purpose, which was to argue that theists should be required to not only offer evidence that God exists, but also show that the word “God” has a coherent meaning. I, like many others, don’t see why the definition needed to change to achieve this. Are most atheists only reporting lack of belief in God? So how does all this work out in internet debate and discussion between atheists and theists? Do atheists on the internet express disbelief or merely lack of belief? The key, surely, is whether atheists are putting forward any proposition, or simply not believing the theists’ proposition that “God exists”? And there are ways of testing this. First, we may reasonably ask an atheist who expresses no belief in the proposition “God exists”, what is their assessment of the proposition “No God exists”. If they also express no belief in that proposition, then clearly they are consistent with Flew’s approach. They are what would once have been called an agnostic, but which they want to call an atheist. But if they have any acceptance at all of the proposition “No God exists”, then the onus is on them to support that conclusion just as much as it is on theists to support their conclusion. Second, we can assess how they discuss the question of God’s existence. If they make any statements of disbelief – e.g. “You have no evidence for that!” or “I think it is unlikely that God exists.” or “Christians are delusional.”) – then clearly they are making propositions, despite any protestations to the contrary, and they can reasonably be asked to offer evidence for them. My experience on the internet is that most atheists do indeed make propositions, and very few are totally neutral (i.e. they have no belief either way) on the question of whether God exists. It can be argued that atheists should be free to define the word any way they wish, just as theists can define what they mean by “God”. But if discussion is to proceed without frustrating misunderstandings, it is best if common definitions are not altered, and if they are, this should be made explicit at the start. The change Flew suggested seems to have muddied the waters, not clarified, and has led to terms like positive and negative atheist (his terms) or strong and weak atheist to define the views once labelled simply atheist and agnostic. I would prefer to stay with the “old” definitions. They are still the ones used by the authoritative Stanford Encyclopedia of Philosophy and the Internet Encyclopedia of Philosophy, and they are simpler. The need for any statement to be supported by reasons can be preserved either way. An atheist wrote to the Stanford Encyclopedia a few years back, requesting the definition be changed to the more modern usage, but the editor declined, pointing out that the older definition was still the one used by philosophers, and saying that Flew hadn’t persuaded his peers on this matter. It is worth reading both the letter and the response. But whichever definition is used, the principle remains the same – whether I make a positive or negative proposition, evidence should be given in support if I want anyone else to consider it. Trying to avoid that responsibility, especially via what may be misleading definitions, isn’t helpful. Christians are encouraged in the Bible to give reasons for their belief (1 Peter 3:15), though, regrettably, many do not. I hope atheists too will be happy to clearly state whether they disbelieve in God, or merely have no belief either way, and to also offer reasons for their belief. And if both sides could follow Peter’s advice and “do it with gentleness and respect”, that would be so much the better! Photo Credit: Anosmia via Compfight cc, with modifications by unkleE.